Did PH snub the UN vote on Syria because of OFWs? The political crisis in Syria took a turn for the worse last May 25 when 108 people, mostly women and children, were massacred in the province of El Houle. Western countries quickly implied that forces associated with besieged President Bashar Al-Assad were behind the attack, a charge the dictator quickly denied. The UN Human Rights Council made a draft resolution deploring the continued human rights violations in Syria. It also called for a “comprehensive, independent, and unfettered special inquiry” to pinpoint the brains behind the May 25 killing spree. 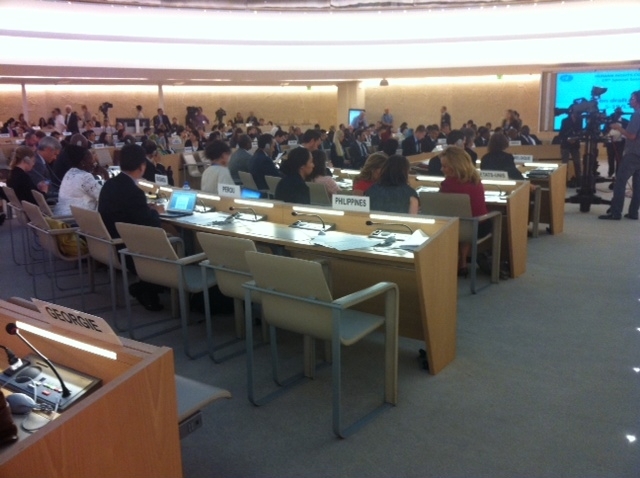 The only nation to be not present during the UNHCR deliberations in Geneva, Switzerland last June 1 is the Philippines. The resolution passed with 41 countries voting yes, 3 no, 2 abstentions — and 1 absent. The country is currently serving a three-year term as a UNHCR member, due to end on 2014. The baffling non-participation of the Philippines during the voting on the Syrian crisis has earned the ire of Human Rights Watch, an international human rights organization. “Apparently, the Philippine delegation had better things to do during the crucial Human Rights Council vote on Syria,” said Julie de Rivero, Geneva director of Human Rights Watch. “One has to wonder why the Philippines became a Human Rights Council member in the first place,” she continued. The HRW also circulated a photo showing the empty seats in the assembly area that the Philippine delegation should have occupied. The government still has not explained the actions of its representatives in Geneva, but one plausible reason is the presence of thousands of Filipino workers in Syria. NOTICE THE EMPTY CHAIRS? Last June 1, the Philippine delegation to the UN Human Rights Council was absent during the deliberations on the ongoing bloody crisis in Syria. The situation turned for the worse last May 25 when over 100 people, mostly women and children, were massacred in Syria’s Houla province. Ma. Luisa de Leon-Bolinao, a professor of West Asian History at the University of the Philippines-Diliman, explained that the Philippine government “can’t possibly take any stand” against Al-Assad because of the thousands of Filipinos employed in Syria. According to estimates from the Department of Foreign Affairs, there are about 10,000 Filipinos working in the said Middle Eastern country. Only 1,500 have been repatriated so far. Nevertheless, Bolinao questioned whether the Philippine delegation really had to go as far as skipping the vote altogether. “Our representatives could have easily voted ‘abstain’ and everyone would have understood our position,” she said, adding that the government can also issue a carefully crafted statement condemning the killings in Houla “without antagonizing the Al-Assad government.” “Instead, the Philippines did a Pontius Pilate by washing our hands of any blame by being conspicuously absent (in the session),” Bolinao continued. The 47-year-old Al-Assad has managed to hang tough despite the unending protests against his 12-year rule. Thousands of activists have been killed since the rebellion began in March 2011. Instead of showing signs of wavering, Al-Assad has responded to the protests through military crackdowns. As the crisis reached its first year, the United Nations Human Rights Council issued a resolution condemning the “brutal actions of the Syrian regime.” The Philippine government abstained from voting. DFA spokesperson Raul Hernandez said the administration’s primary consideration is the welfare of Filipinos in Syria and that they are in fact seeking the assistance of the Syrian government in doing the repatriation. Needless to say, the presence of Filipino workers in many countries the world over has become a major consideration in the way the administration of President Benigno Aquino III has conducted its foreign policy so far. President Aquino’s cautious approach to diplomacy stands in clear contrast to the foreign policy of his predecessor Gloria Macapagal-Arroyo. Arroyo was among the first world leaders to support then-United States President George W. Bush’s global “war on terror,” despite opposition from many sectors at home, including from her then-vice president (and foreign affairs secretary) Teofisto Guingona. Arroyo likewise made the Philippines part of America’s “coalition of the willing,” a group of nations which supported the U.S. military operation in Iraq back in 2003. Aside from sending non-combat troops to Iraq, the Arroyo government also allowed the US to use Philippine air space, ports, and airports in the conduct of their war. The 2004 kidnapping of truck driver Angelo dela Cruz forced Arroyo to pull-out the Filipino contingent from Iraq, a decision lampooned by American officials and members of the Western media. The president justified her actions by saying that the continued presence of Filipino troops in Iraq imperils the safety of the one million OFWs in the Middle East. Mely Caballero-Anthony, professor at Singapore’s Institute of Defense and Strategic Studies, said that Arroyo had no other choice since the Philippine economy won’t be able to survive the possibility of having OFWs returning to the country out of fear for their safety in their respective host countries. The Philippines earned criticism from foreign observers when its ambassador to Norway, with orders from her superiors in Manila, chose to snub the Nobel Peace Prize awarding ceremony last December 2010. One of the awardees for that year is Liu Xiaobo, a detained Chinese human rights activist. Todd Crowell of Asia Sentinel wrote: “Why is (the Philippines) the only Asian country besides Vietnam and Sri Lanka to snub the awards ceremony for China’s most famous advocate of multi-party democracy and human rights?” He also emphasized the fact that Aquino is the son of two democracy icons. Aquino spokesperson Edwin Lacierda reasoned out that this has to be done since a number of Filipinos are facing death penalty in China for drug-related charges. Some of them were eventually executed, but one thing is clear: the presence of overseas Filipino workers around the world has complicated the government’s foreign policy.